The EISXM Series of compact managed switching hubs provides management functionality in situations where outdoor temperatures are expected. Network management is significant in an outdoor scenario because in many cases the location of the switch or switches may not be easily accessible, making troubleshooting difficult. The EISXM Series also supports Simple Network Management Protocol (SNMP). Other management features include VLAN, Trunking, and Quality of Service (QoS). The SNMP agent is comprised of a collection of managed objects that can be queried by an SNMP manager to indicate the status of the switch. When this data is displayed, operators and maintenance personnel, at a central location, can check the entire network by observing selected devices and detecting potential problems before they occur. The programmable fault relay can be connected to a supervisory system. The fault relay can indicate unwanted links or link loss on any port. For applications requiring redundancy, the EISXM family of products offers RapidRing®. RapidRing allows building a redundant Ethernet network that will self-heal in less than 300 ms if any segment of the RapidRing is broken. Redundancy is also possible using trunking. Configuration is accomplished through a web browser via any Ethernet port, or through terminal mode via the local console port. Port parameters are configurable, and device status can be modified and monitored. Either straight-through or crossover cables may be used to connect any of the Auto-MDIX ports to stations or another hub. In addition to one power LED and one status LED, each port has an LED showing link/activity/data rate by color: green for 100 Mbps and yellow for 10 Mbps. Flashing indicates port activity. The EISXM Series is shipped with a DIN-rail clip for installation on TS-35 DIN-rail. If direct mounting on a sub-panel is needed, an optional panel mounting bracket (shipped with the product) can be installed after removing the DIN-rail clip. 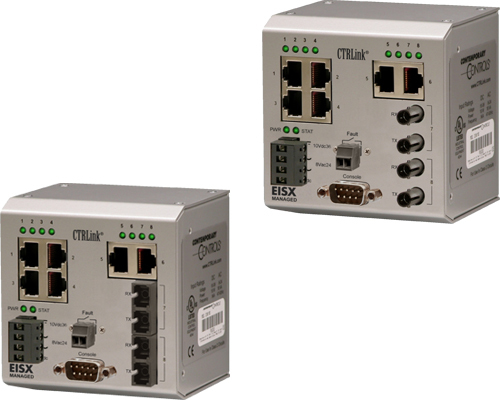 These features place the EISXM Series among the most powerful and versatile Industrial Ethernet switches. Seeking an unmanaged version of this switch?